What is kanten you ask? It’s the original jello (no animal products here!). This is a light and refreshing dessert that won’t leave you stuffed but will satisfy the sweet craving. I always have to keep this dessert away from the kids or I won’t get any. Remove the green stem from each strawberry and thinly, but not too thin, slice each strawberry vertically. 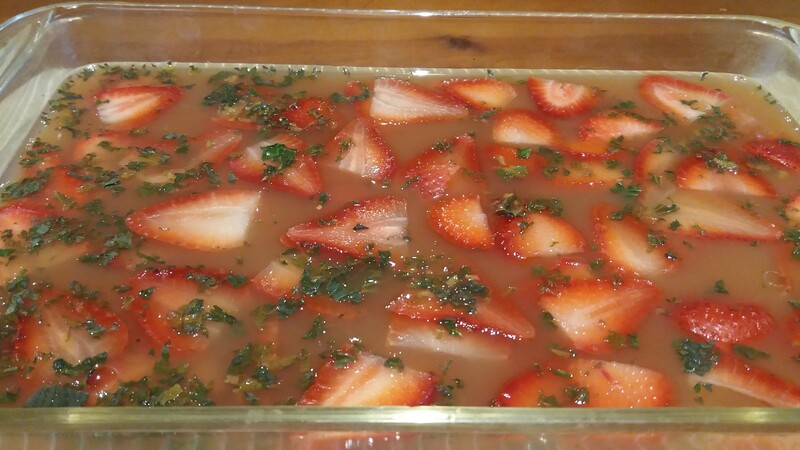 Place the sliced strawberries in a 9×11 glass baking dish. Remove the mint leaves from the stems and mince. 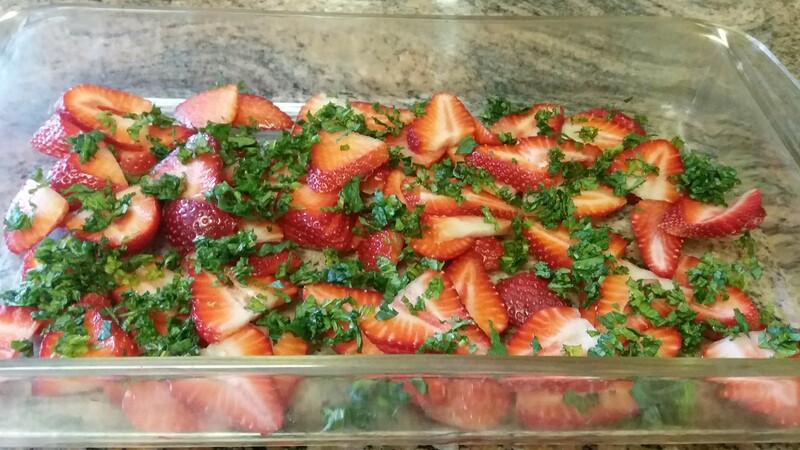 Sprinkle the mint leaves on top of the layered strawberries. You want the entire bottom of the dish covered with fruit and mint. See picture below. Pour apple juice into a pot, add vanilla, agar agar flakes and pinch of sea salt. Bring apple juice to a gentle boil over medium heat ensuring to stir constantly so the flakes dissolve in the juice. Once it comes to a boil, simmer for 2 minutes while continuing to stir then remove from heat. Pour hot juice over the fresh berries. Let cool and then refrigerate until firm. It will take about 1 to 2 hours to firm up. If you need the kanten to set quickly, place mixture in shallow individual serving bowls and refrigerate.